Waving Tubes - A fun ATTENTION Grabber from Spot Promotions! Skydancers are also called dancing tubes, air tubes, air dancers, dancing men, inflatables, waving tube man, inflatable man, inflatable dancers, inflatable balloon characters or air blown inflatables. Whatever you call the waving tubes, you've seen and noticed! Skydancers turn heads and bring in new customers! Waving Inflatable Tube rental, is a popular and economical option. Skydancer rental includes delivery, fan(s), set-up and removal of the inflatable advertising. Skydancer sales are also offered by Spot - With very competitive pricing, a wide variety of inflatable styles, and the capability for custom creation of anything outdoor promotion you can imagine. Spot Promotions can take care of every facet of your inflatable rental or purchase, from delivery, installation and maintenance to removal, storage and cleaning. Spot Promotion's goal is to deliver a worry-free promotion, letting you can focus on your sales and customers. 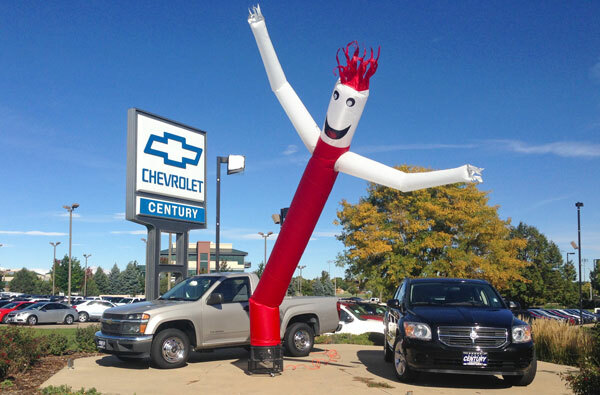 Spot Promotions offers waving tubes in a variety of styles: Different heights, simple tubes, "waving man dancers" with two legs, etc. With 15 years of experience in inflatable outdoor advertising and balloons, Spot knows how to help you pick the right waving tube for your location and specific promotion. Spot can help you to select the type of waving tube dancer that will work best in your location. Our free on-site survey will help you clarify what type of outdoor promotion is best for your business. Waving Tubes can be very effective when used alone, but, for some applications, the effectiveness may be enhanced when combined with pennants and/or banners. Combine your creativity and Spot's outdoor advertising product experience, and we'll create a winning campaign. Call us at 303-320-4400 or email for more details! Q: It's windy (or snowy, cold, sunny, etc.) here in Colorado. Will the air dancers work here? A: We've been in the inflatable business in Colorado for 15 years - based in Golden, CO, Spot has installed thousands of inflatable promotions in the Denver Metro area, all of the Front Range, and even in Wyoming. We understand how to install and secure waving tubes in the Denver area and all of Colorado. Spot Promotions will do it right! Q: What's better? Waving Tube Rental or Purchase? A: Rental and Purchase both have advantages. For a one-time promotion, air tube advertising rental is a very economical choice. However, many clients find that the waving tube outdoor promotions are very successful, and opt to purchase standard or custom Skydancers that will save money compared over multiple uses. Q: Why choose Spot Promotions? A: Spot Promotions staff has decades of experience with inflatables, pennants, balloons, blimps and all types of outdoor promotions. We can help you quickly and easily choose the program that works best for your specific location. Spot's experience and technical knowledge ensure that your promotion will go smoothly. Q: I have concerns - what about zoning, landlords, permits, etc? A: Spot Promotions has successfully installed temporary outdoor advertising in thousands of locations in the Denver area, and other areas of Colorado and Wyoming. We know local rules, and we'll be able to provide knowledgeable answers to your questions. Call us at 303-320-4400 and you'll get the answers you need quickly and easily. Q: How do the inflatable tubes work? A: Inflatable advertising tubes are made from a nylon or polyester tube. The bottom end of the tube is attached to a high-powered blower (or blowers, if their are two legs, as on a typical "waving tube man" inflatable). The tube inflates and expands the entire length of the sleeve, creating an opening at the through the end of the tube causing the tube to deflate and wave. As the tube deflates, the opening is closed, and the tube reinflates repeating the process. Naturally occuring air currents causing the motion to be slightly different every time, increasing viewer interest in the motion.